Sarah Palin has said she's like to see Margaret Thatcher during her upcoming trip to England, but the 86-year-old isn't interested in letting Palin bask in her Reagan-esque glow. A source says, "Lady Thatcher will not be seeing Sarah Palin. That would be belittling for Margaret. Sarah Palin is nuts." 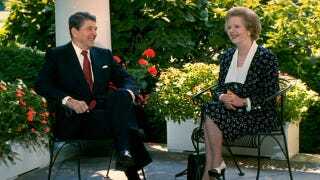 Apparently Thatcher would rather attend the unveiling of a Ronald Reagan statue at the U.S. embassy than meet with the non-candidate. "Margaret is focusing on Ronald Reagan and will attend the unveiling of the statue. That is her level," adds the source.